The Legend of Zelda: Majora's Mask is the sequel to Nintendo's 1998 smash hit The Legend of Zelda: Ocarina of Time. Majora's Mask introduced the world to the unique artistic bent of director Eiji Aonuma, who would later return to direct such games as The Legend of Zelda: The Wind Waker. 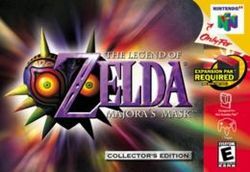 While Majora's Mask was based on the same engine of its predecessor, it added a very vivid Japanese art design, and a new "72-hour" game system, wherein Link has a set amount of time to complete each dungeon or task. The implementation of the new time limit system was flawless and added much to the depth of the game. Majora's Mask required the Expansion Pak in order to function, allowing for more detailed graphics and more characters per area. Majora's Mask added a varied assortment of magical masks to Link's arsenal, which upon being worn, would bestow special powers upon Link. The many masks, in addition to the time system, make Majora's Mask one of the most unique games in the Zelda series. Majora's Mask was later released on the Nintendo GameCube on November 24, 2003 as part of The Legend of Zelda: Collector's Edition and on the Wii Virtual Console service on April 7, 2009. A remake for the Nintendo 3DS, titled The Legend of Zelda: Majora's Mask 3D, was released in the U.S. and Japan on February 13, 2015 in both physical and digital formats (via the Nintendo eShop). This page was last edited on 1 February 2017, at 01:31. This page has been accessed 227,814 times.